With a script by William Goldman and director Richard Attenborough at the helm, Magic is indeed a classy affair that exhibits a surprising amount of nuance, subtly and stellar performances - especially from a young Anthony Hopkins. This is after all a movie about a killer doll. Isn't it? The film successfully juxtaposes the bizarre with the mundane, and mixes elements of psychological horror with the blatantly supernatural. This is highlighted perfectly in the opening shots of a cluttered flat full of bizarre bric-a-brac that sit alongside everyday household objects. Corky is a struggling entertainer who fails to even hold the attention of his audience, let alone convince them of his talents. He returns home downcast and defeated. We then cut to several months later and suddenly Corky seems to have emerged as a strange overnight success. His burgeoning reputation leads to him being offered his own TV show. Bizarrely though – and in the first indication that all is not what it seems with Corky and Fats – he refuses this opportunity because he will have to undergo a medical exam. He flies into an unhinged rage when his agent Ben (Burgess Meredith) tries to make him see sense. Fleeing to the countryside, Corky rents a secluded and rustic lakeside cabin from his high school sweetheart Peg, and at this point the narrative begins to chart the rekindling of their relationship. Adding to the uneasy tension however is the fact that Peg is now married. Magic is positively peppered with bizarre and creepy moments. The quiet scenes, in which Corky converses with Fats when they are alone, are immensely creepy. While Corky appears to be a kooky eccentric, there is nonetheless a genuinely dark and worrying slant to his character due to the privileged vantage point we see him from. Something very sinister is obviously afoot. When Corky arrives at the cabin Fats begins to call out from the suitcase he’s been stuffed into. 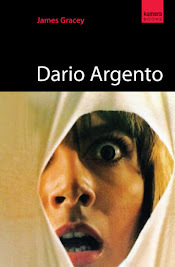 Everything remains ambiguous until the films final moments - is Corky insane? Or is Fats really alive and bumping off the cast? An already tense atmosphere is gradually brought to boiling point when Ben tracks Corky to the cabin and, after he walks in on Corky and Fats having a full scale argument (Awkward much! ), confronts him in an unbearably intense scene. After attacking and seemingly killing Ben, Corky must now dispose of the body in a protracted and taut sequence of events. A wonderfully macabre shot of Fats 'watching' from the window of the cabin, framed in darkness, is sufficiently chilling. When Peg realises that Corky is faking a phone call and that her husband has disappeared the tension becomes almost too much. The final shot of the film as Peg races to the cabin clutching the wooden heart Corky left for her is spine-chilling, nasty and will perhaps even induce a nervous chortle before the ramifications sink in. The last glimpse of Peg’s contorted face is totally shocking. Magic boasts top notch performances from all involved. Hopkins seems gentle, charming and quite timid: even before Hannibal Lector came along, he was already convincing as a softly spoken, gentle mannered PSYCHO. 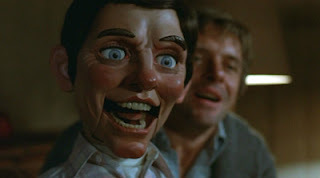 As with other similar films such Dead of Night, Pin and Devil Doll, the uncanny appearance of the actual ventriloquist’s dummy is where much of the tension comes from – as we constantly wait for it to move - so lifelike and yet, not lifelike. Interestingly the film touches on a number of aspects of ventriloquism no longer really associated with the art. Nowadays it is associated with entertainment and the subject of creepy old movies (ho-hum!) – however in pre-Christian times ventriloquism actually originated from the practice of necromancy. All along the audience are led to believe that what they are watching is a character study charting the mental disintegration of a man who is coming to terms with newfound fame and success and he is eventually driven mad by it. 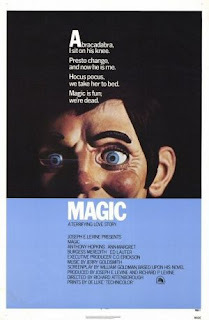 However when one views Magic from the perspective that Corky has perhaps been dabbling in black arts and occultism, it throws yet another fascinating layer into the mix and ensures the film retains an appeal that endures after multiple viewings. It is testament to those involved in the making of Magic that this revelation never feels like a cop out. Check out Ventriloquism: A Disassociated Perspective by Angela Mabe – a paper that charts the origins of the act of ventriloquism from its roots in necromancy. Great review! This movie always creeped me out as a kid. The mere mention of it, or the clips for an airing on television would send me into spine-chilled fits of terror. Creepy still, as an adult, and scarier on many more levels. And ruined ventriloquist dummies for me, for life. The only time Richard Attenborough directed a horror film and the result was chilling and memorable. What makes Magic even more distinictive is that it followed A Bridge Too Far, a film that couldnt have been more different. Though Magic isn't entirely without precedent for Attenborough. His turn as John Christie in 10 Rillington Place is something of a dry run for the creepiness of Corky and his wooden buddy. Cheers guys. I was mightily impressed by magic - it cemented my love for Anthony Hopkins - his performance in this film is surely amongst his best. I agree James - this and The Elephant Man are my favourite Hopkins films. Lovely review. 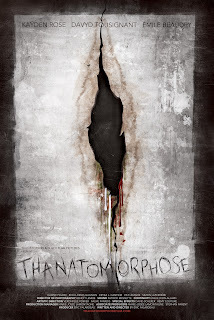 Such a creepy creepy film. Did I ever mention how much I hate creepy dolls? Well, there it is. This movie and a certain Twilight Zone episode scarred me for life. But your review makes me want to see this again - and if a movie can make such an indelible impression when one first sees it, then it's worth freaking out at again. 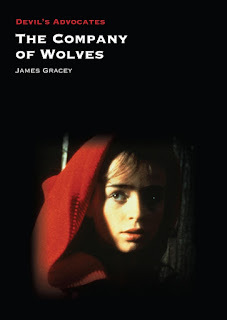 I really dug this movie, and I found Corky's fate to be quite moving and heart breaking. Even though he was a total loon, I couldn't quite shake the doomed hope that maybe somehow he could shake free of his murderous streak. 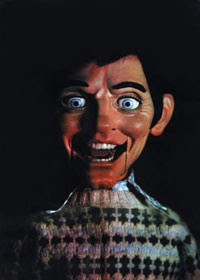 As for ventriloquism films: did you ever get to see Dead Silence? 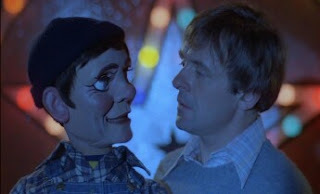 It's not the best movie ever made, but has a few creepy moments (a room full of ventriloquism dummies suddenly turning their heads in the direction of the protagonists). I'd say it's worth watching! Also, you mention the Devil Doll: is this the Tod Browning 1936 or the 1964 movie? Shaun - Yes! The Elephant Man was probably the first film I ever saw Hopkins in - that is a damn fine performance! Stac - I agree completely and I think it is testament to Hopkins' performance, the chesmistry between the characters and a great script, that we still hang on to the hope that Corky will somehow be ok by the end. I was referring to the 1964 movie (I've never seen Tod Browning's Devil Doll - I should probably add it to my list!). Cheers for that.